Schwalbe's entry level tyre (folding) is now even better. With a good colour choices available, they features a new dynamic tread with K-Guard puncture protection & the Silica compound that grips well in the wet offering great performance. Silica is a special filler in the rubber mixture that positively influences the rolling resistance and wet-grip. 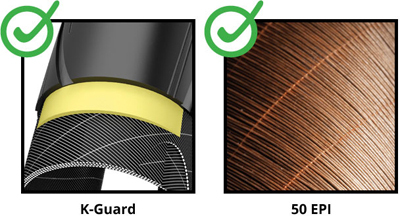 K-Guard is Schwalbe's minimum standard for protection belts. This guard has been proven for many years. It consists of natural rubber and is reinforced with Kevlar fibres. Together with 50 TPI carcass all Active Line tyres, which the Laguno sits in, are protected against punctures.